One hundred objects from museums across the UK with resources, information and teaching ideas to inspire your students’ interest in history. Archaeologists have long known that in the Mesolithic period, after the last Ice Age, people lived as hunter-gatherers, constantly on the move following the herds of animals that they relied on for food and in order to exploit different plant resources that were available in different seasons. The site of Star Carr has shown that in some cases hunter-gatherers might create more permanent settlements. Star Carr is at the edge of the basin of what used to be a large lake, called Lake Flixton, which dried and was drained over hundreds of years until it finally disappeared. From the huge number of animal bones found at there, archaeologists at first thought that it was a temporary hunting camp. However, the waterlogged soil had preserved organic remains that rot on other Mesolithic sites. The remains of a wooden platform built out into the lake were the first hint that Star Carr was a longer-term settlement to which the people returned on a regular basis. In 2008, the post-holes of the earliest house in Europe, a substantial tepee-like structure, were also found, confirming that these hunter-gatherers spent considerable amounts of time in the settlement. It is thought that the settlement at Star Carr had become established by 9000 BC. On a site of this date, it is very rare to find anything other than a scatter of flint flakes from tool making. At Star Carr, the organic materials that usually rot were exceptionally well-preserved in the peaty soils. This helped archaeologists understand more about what life was like there. The richness of the animal and plant life around the lake meant people did not need to move very far to find food. Red deer roamed the woods, along with other animals the people hunted, such as roe deer, elk, wild cattle (aurochs), and wild pig. The lake was full of wading birds, such as crane, loons and grebes which were also hunted. Beads were made from amber, shale, bone and animal teeth. The amber would have been gathered from the beach, having floated across the North Sea all the way from the Baltic. Animal teeth and bone necklaces confirmed the skill of hunters and may have been used to express family or group identity. Although no boat has been found dating to the Mesolithic period Star Carr is the only place in Britain with evidence that boats existed: a wooden paddle was preserved in the waterlogged soil. 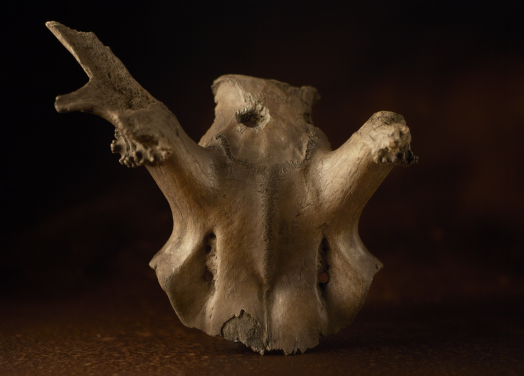 In the original excavations in 1949-5, twenty one red deer antler headdresses, called frontlets, were found. These frontlets are extremely rare and only a few others have been found in Europe. The skull of the deer had been cut and trimmed and holes were drilled with flint tools. Leather laces were probably threaded through the holes to tie around a person’s head. It has been suggested that the hunters used the frontlets as disguises so they could influence the movements of the red deer and trap them without panicking them. Another explanation is that they were used in ritual dances to bring about a successful hunt or in celebrations after a successful hunt. A large number of barbed arrowheads made from red deer antler were also found. They were discarded without being used. Some archaeologists suggest that this could be evidence of the placing of objects into the shallow waters around the lake as thanks to the animals that had been hunted. Star Carr Research Project website. The history of research and videos of work on site are most useful. Information from the English Heritage website. BBC article by Julian Richards challenging the idea of nomadic hunter-gatherers with the evidence the oldest house then found, at Howick in Northumberland.